The data is clear: Democrats must change strategies or they will never succeed. DemocraticLogo by Source. Licensed under Fair use via Wikipedia. 1. Lack of experience with competitive races. 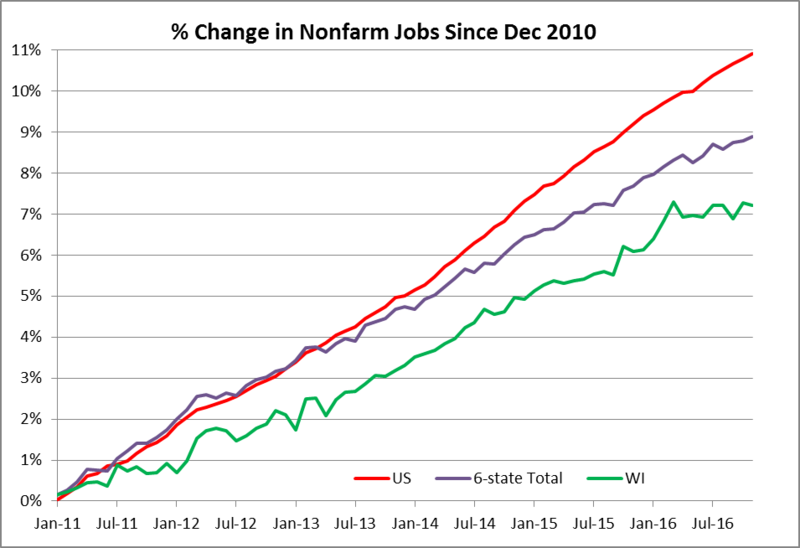 The ideal Democratic candidate for a statewide office in Wisconsin is one who has already demonstrated success in a two-party race. But who is that candidate? The “pack and crack” gerrymandering strategy used by Republican legislators to assure they would continue to control the legislature depends on packing an overwhelming number of Democratic voters into a few districts, allowing for a larger number of safe Republican districts. A side effect of this strategy is to create a large number of single-party districts. One result is a shortage of potential Democratic candidates practiced in reaching out to independents and Republicans. Last November’s election only made this problem worse. Of the 99 Wisconsin Assembly districts, 49 had candidates from only one of the major parties. Potential candidates from the missing party decided their cause was hopeless. The effect is not symmetric, as can be seen in the following chart. 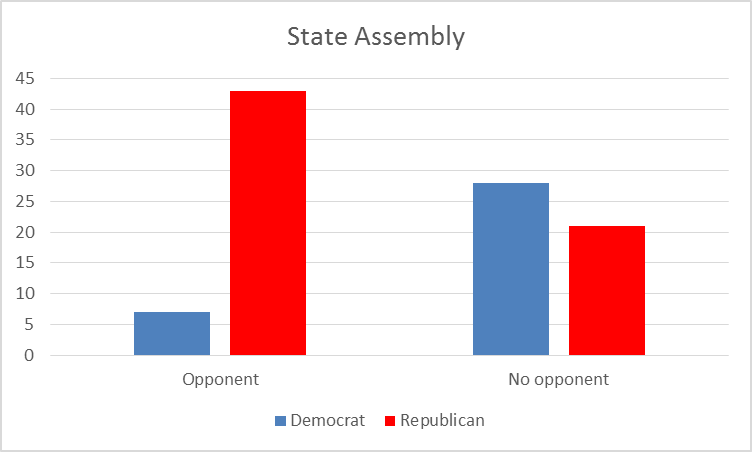 Only seven Democratic Assembly members had a Republican opponent. A similar—if not as extreme—effect shows up in the races for state senators. 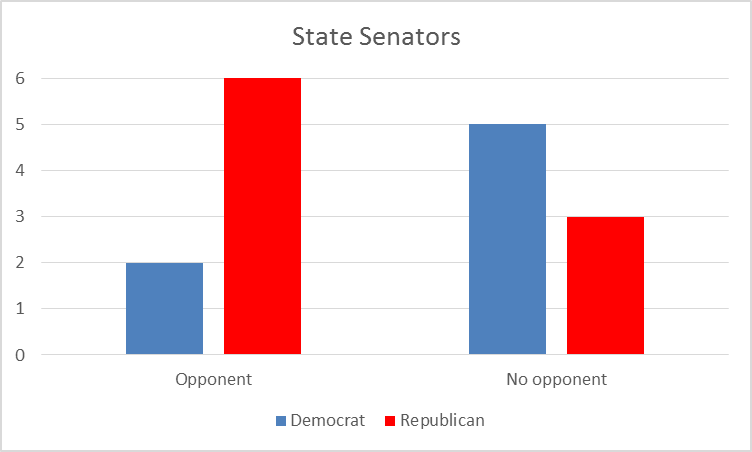 Of the sixteen senate seats up for election in November, seven were won by Democrats. Of these seven, only two had faced a Republican opponent. This effect also showed up in the races for Representatives in the US Congress. 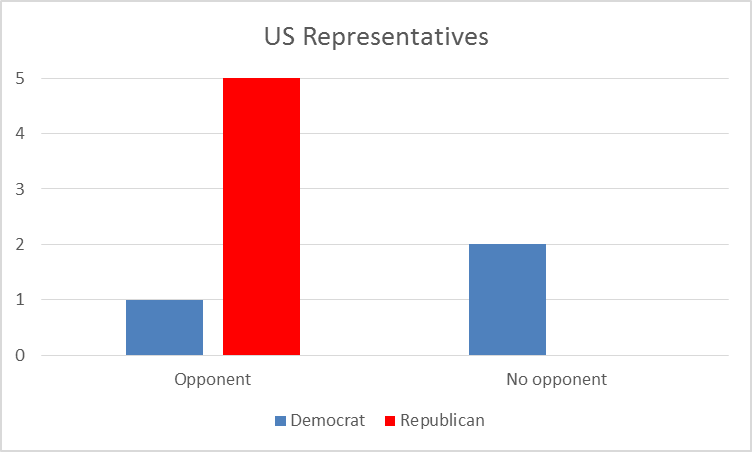 Only one of the three Democratic Representatives had a Republican opponent. In looking towards the 2018 race for governor, there is a lack of Democrats likely to be successful. In part, this reflects the inward-looking effect of safe seats, where the outcome is settled in the partisan primary, rather than the general election. 2. Winning the gerrymandering lawsuit would not guarantee electoral success for Democrats. Fighting the highly partisan gerrymander is good for the country. Allowing one party to entrench itself undermines democracy. The creation of numerous safe seats also contributes to increased polarization. However, a victory in the lawsuit alone will not solve the Democrats’ problems. This is illustrated by the November election results. Which party won the vote for the Wisconsin Assembly in the November election? With almost half the seats uncontested, one cannot simply add up the votes and declare a winner. Doing so would imply that there is no support in the district for the missing party. Waukesha County illustrates the problem with this assumption. Its Assembly seats were among those uncontested by Democrats. Yet Hillary Clinton still managed to win about a third of the votes. The approach I used to estimate the statewide vote for the Wisconsin Assembly started with results from districts in which both parties fielded a candidate. Then I regressed these district results against the percentage of the vote for Clinton in the same districts. This factor was applied to the Clinton percentage in the single-candidate districts to estimate what number of votes each party would have received if each had run a candidate. The final tally was calculated by adding the estimated results of one-candidate districts to the actual results from two-candidate districts to get an overall estimate of how each party would have done if they each fielded candidates in every district. The resulting estimate is that Democrats would have won 47.5 percent of the Assembly vote. There are a number of limitations to this estimate. For example, even in two-candidate districts, one might have been a much stronger candidate than the other. Likewise, either Trump or Clinton might have done particularly well or poorly in an individual district. How many seats would Democrats have won if there were no gerrymandering, making the efficiency gap (EG) zero? How many Assembly seats would Democrats have won? I used what is called the “Simplified EG.” The simplified version of the efficiency gap assumes all districts have the same turnout. Nevertheless, in my experience its results closely track the full version. where S is the percentage of all the seats won by a party and V is the percentages of votes received by that party. Setting EG to zero and solving for S estimates that in a perfectly fair redistricting, Democrats would have won 47 percent of the districts or between 46 and 47 seats. While this result would have been much better for Democrats than the actual outcome, it still puts the Republicans in control. 3. Solving the Waukesha County challenge. Although, as already noted, Democrats tend not to bother running candidates in Waukesha County, it is actually a major source for Democratic votes. 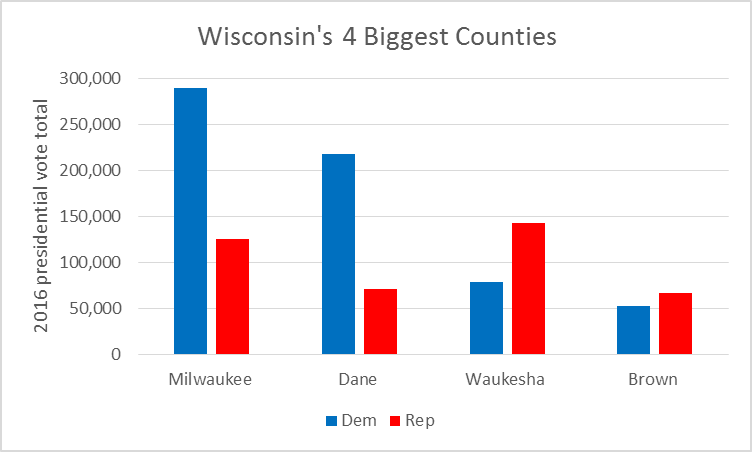 In fact, as the next chart shows, it comes in third place among all Wisconsin counties as a source of Democratic votes. This creates a major quandary for Democrats (and similarly for Republicans in Milwaukee). How do Democrats cultivate those voters and expand their number if no one wants to make a doomed run for office? Perhaps one answer is that in looking for a possible candidate for governor, Democrats expand their horizons. Are there Democrats who ran and lost in places like Waukesha County, but did better than expected? The legal effort against gerrymandering is not the first example of something expected to rescue Democrats. Wisconsin Democrats have a tradition of celebrating unhatched chickens. One had only to view the Journal Sentinel comment section to see the widespread confidence that Scott Walker would end up in jail. Or that assuring the right to vote to every citizen would be sufficient to swing elections. While restoring Wisconsin’s reputation as a state that does not tolerate political corruption and making it easy for voters to vote are important causes, they are important in their own right, not because they would help one or the other party. Making them partisan issues only serves to devalue the cause. In the last few years the predominant example of the “something will turn up” hope has been the expectation that demographic change will turn states blue. Growing numbers of Hispanics, blacks, and other minorities would lead to inevitable Democratic majorities, in this view, which has often been accompanied by a willingness to write off working class whites. While working class whites—and those in smaller cities and rural areas—are a shrinking part of the electorate, they are still a very large part. Democrats in Wisconsin and other upper Midwest states were particularly vulnerable to their loss for two reasons: the fact that Democrats still had strong support from this demographic, unlike much of the South, and the slowness of the expected increase in minority voters in states like Wisconsin. 5. The lack of a credible Democratic plan for job creation. What is missing is a credible Democratic jobs plan. This leaves a sort of vacuum that is filled by either the traditional Republican plan based on reducing taxes and regulation or the Donald Trump version that includes reversing globalization. Much of the Democratic agenda—including the Affordable Care Act, increasing the minimum wage, requiring parental leave, and increasing the earned income tax credit—can be regarded as aimed at limiting the pain of joblessness or making jobs better, but not creating jobs in the first place. One can be very skeptical of Trump’s plan to bring jobs by restricting imports, but where is the Democratic jobs plan? For years, Wisconsin had a national reputation for good governance, including a vibrant two-party system. It is painful to watch that reputation being tossed aside. How about a program or better yet a revamping of an existing program that coordinates technical college and universities to businesses in a way that develops a program that quickly produces qualified candidates. All Democrats have to do is run candidates that support immediately ending the hugely unpopular life destroying failre of cannabis prohibition immediately in Wisconsin anf they will win. Madison and Milwaukee are in the bag but up north people, including many who.voted for Trump, are sick and tired of this wasteful, discriminatory abusive policy. Legalize it! If the Dems don’t, eventually Republicans will. Left out of this is one of the most important issues. Dems, and some of their supporters, need to stop being childish. When the legislators left the state, many people saw that as childs response to not getting their way “I am going to take my ball and go home.” The whining and hysterics need to stop. It is fine to protest and debate, but yelling “shame” or heckling a speaker is not the way to do it. I know a number of people who would have voted democrat, but they were so turned off by the antics, they either voted republican, or did not vote at all. #1 – Run anyway – whether you have money or not. Skip the expensive TV and radio ads, most people don’t listen anyway. Mailers go in the garbage can directly from the clogged mailbox anyway. Use social media and the internet to network, use as many local groups and resources as you can. We cannot outspend Republicans, don’t even try. Theirs was an expensive top down movement that doesn’t serve the people and can not last unless we give up. The message and commitment are important. Find those people/groups disaffected by Republican policies and connect. There are going to be a LOT of people disaffected by Republican policies. #2- no it won’t, but it will help, See #1. #3 – Run anyway. If the Republican game plan isn’t working for Democrats, then don’t use it. Grassroots is different than big money interests co-opting a party. Use Social media and move around and talk with people. Give people hope and vision. Ask for votes, educate on issues, educate on what the other side is really about, educate on inequity, make it personal, be honest about challenges. See #1. See Obama’s goodbye speech. The failure of Dems to field good candidates, then talk about important things: Home and family, Jobs and economy, transportation and the things that epee do as interest like fishing, hunting, others. Deer hunting in Wis is like a religion. You think the nutty ideas like Pot, toilets, gah marriage, min wage and others do not win elections. Pot – the cost of locking people up for using and selling it is not nutty. I too, think we do not need another substance to alter people’s consciousness, but the cost of locking them up is serious. Conservatives are supposed to be about free choices, right? Toilets – these bills are introduced by Republicans, not Democrats – speak to them about it. Conservatives are supposed to be about free choices right, not bathroom police? Gay Marriage – It is a right, what was your point? Conservatives are supposed to be about free choices, right? Deer Hunting religion – ask the DNR or read the papers, or visit some lands and streams to see how well their agency has fared in protecting water, air, land, public lands, forests under the conservative regime. There was a day when Republicans did help protect our environment in this state. Now, it is all about profits for big money donors. Yes, the people have a tough road ahead, but we can do it. Minimum wage – I know it is not enough, but it is a start to raise wages to a level where people can afford basic needs. $15.00/hour is not enough, certainly $7.25 is not. Conservatives have needs too, right? A lot of people care about the minimum wage, which is directly related to jobs and the economy. Democrats talk about those things all the time. They also talk about transportation all the time. It’s wacky to suggest they are failing because they don’t talk about deer hunting enough. Did you know that Robin Vos, a Republican (gasp! ), was just talking about marijuana? And who brought up toilets? Jesse Kramer, a Republican, with his “bathroom bill.” Facts continue to elude you WCD. You aren’t adding new substances people! Newsflash! It’s already everywhere in the state and has been for decades. We need to regulate this industry to keep it away from kids and allow responsible adult use like other more egalitarian states have and all of Canada is doing next year. Ending the life destroying failure of Prohibition in Wisconsin is far from “childish”. This is fundamentally a civil rights issue. Cannabis prohibition and the glaring racial disparities in enforcement is the new Jim Crow. Wisconsin has stuck its head in the sand and allowed drug cartels to run wild in a black market. Dems and Repubs in Wisconsin the dark ages on this issue but it’s time for them to grow upnand educate themselves. I agree with conservative digest. Let’s embrace the free market versus the black market, embrace states’ rights vs bloated intrusive feferal bureacracy, embrace individual liberty and responsibility vs the big government nanny state, and most importantly embrace the strong 60% bipartisan majority in Wisconsin who want to end the trillion dollar 50 year FAILURE of cannabis Prohibition. Yes, we need to regulate this industry to shut down the black market so as to regulate it to keep it away from kids and allow responsible adult use. Right now it’s in every school and park in the state!? Prohibition has been an abject failure. What put the beer barobs and gangsters out of business during alcohol prohibition? Was it police? Was it laws? No! We ended prohibition! The first major party that supports ending prohibition in Wisconsin will win. Mark my words! It’s that prevalent and that popular in the state. Old timey dinosaurs and big government Prohibitionists may very well be ignorant of this to no one’s surprise but most of them in Wisconsin are slowly drinking themsrlves to death so fear not! Time is on our side. Great article Bruce! As good as any as I’ve seen breaking down the challenges Democrats face in the future and the graphs were extremely helpful. Cliche as it sounds, the problems they face in Wisconsin seem to mirror many in the country. There are no permanent victories in politics and no reason for fatalism…things looked dire for Democrats in 2004 and four years later they had the Presidency and had a house majority with a filibuster-proof Senate majority. But hard work lies ahead and sober analysis like this is always welcome. Every week or two WCD rails against pot. In that time, seven people are killed and more than one hundred injured in an alcohol-related crash. Every week there are more than 400 convictions for a drunken driving offense. Meanwhile the media glorifies excessive drinking and the tavern league lobbies politicians so nothing gets done. But yes pot is the problem. I think this year there was a disconnect between saving the Obama administrations policies and what Hillary Clinton had to offer to African Americans. It is probably a stupid argument to make that black voters will only vote for a black president but the numbers show that the city of Milwaukee had 20 percent less votes than in 2008 and 2012. I thought Democrats were the party of social justice. Why don’t the Democrats demand slave reparations for work done between the years of 1665 to 1965. Bernie Sanders would be president today if he ran on this issue. And Clinton not being black is the only reason she lost? You are a terrible political analyst. It is a stupid argument. Where in the hell do you get this stuff? Alex Jones? Richard Spencer? I think one can become overly analytical re: causes of Democrats’ eroding popularity. DJTrump has put in doubt the conventions of electoral success, simply by being who he is and doing what he did. Trump has shown that you don’t look to past election strategies to find a winning one of your own. What Hillary Clinton did was “by the numbers” but she was using an outdated play book. It’s reminiscent of nations losing militarily when they employ mostly the strategies and tactics that worked in the previous war. Or the British in the Revolutionary War. Or the US in Viet Nam. Bernie Sanders was not even a “traditional” or “official” Democrat, either, though like Trump he ran under the banner. Possibly, it was he who sowed the seeds of defeat for Clinton by virtue of showing how an “outsider” to the establishment could change the electoral dynamics and win voters who were simply fed up with that establishment. So I would suggest that Democrats in Wisconsin (and probably elsewhere) will need to go outside the box now in hopes that an inspiring and innovative man or woman is willing to lead the way for other candidates statewide. Simply put, the party renewal needs to be led by someone outside the government mainstream. Events have conspired such that Democratic regulars in Wisconsin are viewed as losers, the party perhaps even as an anachronism; time and public sentiment has moved beyond them and they have been anything but nimble. Clearly, Tom Barrett did not capture the imagination, and I wonder how many voters even remember the name of the last challenger to Walker. Neither of them were remotely transformational. New challenges and opportunities call for new thinking; bold thinking, actually. Analysis is necessary, of course, as presented here, but will not be sufficient without bold and unconventional leadership. This is not really an argument against your larger point, which have quite a degree of validity. But some of your data seem to suggest that Democrats do a better job of fielding candidates in hard Republican territories than Republicans do hard Democratic territories. That’s not to say they could not do a better job, but it seems to me that too blame the Democrats for running a lot of races in which they have no opponent seems to have it rather the wrong way around. 1. Dems are more willing to take on hopeless causes. 2. That is the inevitable result of the pack and crack strategy. To a potential candidate a 55% district looks winnable, whereas 80% does not. 3. The experts at running against Republicans are the losers, not the Democrats in the Assembly. Tim Caine pick was a winner. The NY post headline on October 31, 2016 of Hillary already planning her giant victory celebration- Spending millions on a fireworks show on Election night over the Hudson bay. The Hillary Campaign spending millions in deep red Nebraska. Also, the Mexican President inviting Trump to Mexico and Hillary snubbing the President of Mexico. I suspect that others could add to this list.